Chinese New Year Festival 2011 presents THE IMPERIAL BELLS in Concert at the Sydney Town Hall. Nine rows of nine lanterns hung on either side of a Chinese New Year banner for 2011. Behind, is the gloriously restored Baroque-looking organ. Two cultures present and meeting in an exchange of art and ideals, for in the foreground is a one third replica of the imperial bells, also called Bianzhong, and they have a history dating back 3600 years, and like the Western organ in our western music heritage, have played an important part in China’s ritual and court music. Hung on a wooden frame this set of chime bells, of different sizes, are waiting to be struck by mallet. Anticipation was high. This concert arranged and organized by the Hubei Province People’s Government, the Cultural Department of Hubei Province, the Consulate-General, the Embassy and the Ministry of Culture of the People’s Republic of China presented the Hubei Chime Bells Orchestra, formed by this collection of bronze chime bells and a Chinese folk orchestra (part of the Hubei Province Opera and dance Theatre), conducted by HONG Xia. The range and sound of the instruments, tantalising and fascinating to see and hear. The program was diverse and extremely entertaining and illustrative of the Chinese cultural inheritance with some nods to the absorption of gentle Western influence as well. The large orchestra played a range of music and it appeared most engaged and thrilling, especially in the second to last piece, announced by our hostess as a suite from the Red Guard Opera, Hong Lake Capricio. The orchestra were visibly disciplined and communicated electrically with a guest soprano soloist, supported by the male orchestra members responding in vocal chorus, as well. The excitement of this work was communicated. I remembered seeing such an opera performance in Shanghai and thought it would be exciting to see again, this longing, triggered by this performance. Demonstrating their Western musical knowledge the orchestra also accompanied two Chinese opera singers in a rendition of Giuseppe Verdi’s Brindisi from LA TRAVIATA, arranged by Nie Zhiyong. Mr Zhiyong also arranged a version of Waltzing Matilda for the orchestra. They also accompanied ZHANG Hongyang, who played his large traditional bamboo flute in two extraordinarily dexterous displays of his skill and mastery of the instrument. 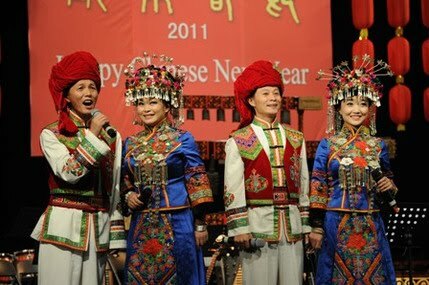 The highlight, for me, was the traditional Hubei Changyang folk song: BEAUTIFUL SISTER, performed by the TU-MIAO COUSINS GROUP (Wang Aiming, Wang Aihua, Zhang Mingxia, Wu Juan in stunning Tu and Miao folk costume. The unusual sounds and harmonic interleaving were mesmerizing to hear. The concert was less than 90 minutes and it was beautifully arranged and presented. Brevity being the soul of wit, the choice and presentation of the music was elegant and swift. Less may have been more. Elegant sufficiency’s. A stimulating encounter with China through its musical arts. Much thanks for the opportunity to hear and see such beauty.